This recent dinner at Thomas Keller’s Ad Hoc was fabulous treat after a long day of tastings in Napa Valley. A few years ago I had the opportunity to spend a two days at Keller’s Bouchon in Los Angeles. I had dined at Per Se and been in plenty of restaurant kitchens before, but I had never seen anything like the kitchen at Bouchon. For starters, the three Bouchon outlets are connected via live television screens, which allows chefs to speak to each other across locations in real time. The stainless steel tables that serve as plating stations are all covered with white tablecloths. Linen is one of the highest costs for restaurants, so I was surprised by the amount of tablecloths in the kitchen. One of the chefs explained that the goal was total perfection in plating. The tablecloths were used so that even the smallest mistake would remain visible throughout service as a reminder of what was expected. That same attention to detail is evident throughout the Keller empire, even at Ad Hoc, the most casual restaurant in the group, excluding the Bouchon bakeries. Ad Hoc offers one four-course menu, served family-style, for the entire room. Diners can add an optional fifth middle course, but otherwise what you see is what you get. The menu is posted each morning and changes every day, with the exception of Mondays, which is fried chicken night. Tables are tightly spaced and the ambience is informal, but there is no loss of focus on the quality of the food. The wine list is extensive, especially for such a small restaurant, and very well chosen. Ad Hoc could use a major upgrade in stemware. The thick, stemless glass tumblers, an improvement over the hideous flutes that are initially brought over, are fine for simple wines, but far from ideal for so many of the better wines on the list. Yes, the setting is informal, but Keller serves his braised beef in gleaming, new All-Clad cookware. Why is the same level of attention not paid to stemware? The mixed greens taste like they were literally ripped out of the ground just a few minutes before service. 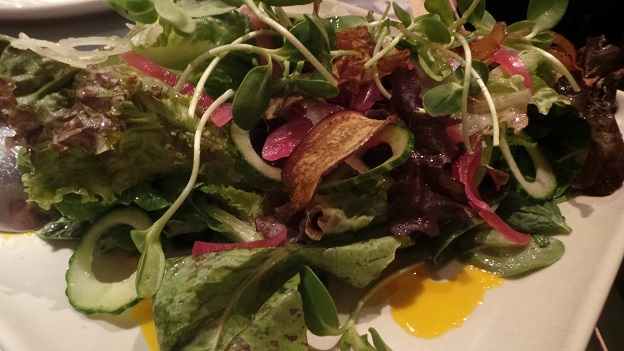 Crisp flavors and textures are accentuated by the delicious carrot-ginger dressing. The tempura shrimp for two and the braised beef short rib are served together, which is awkward as there isn’t really enough space on these tables for all of that food. I am not sure what the logic is of coursing a meal and then delivering two of the courses at the same time. No complaints on the food, though, everything is delicious. 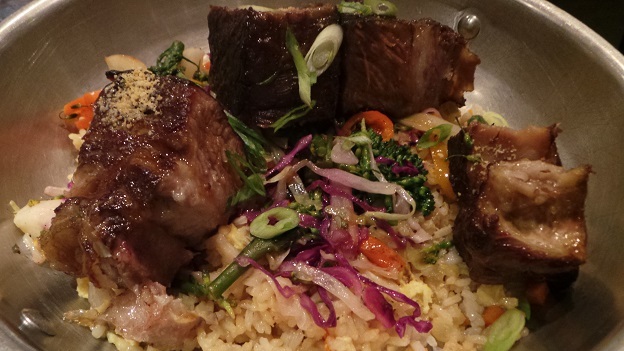 The braised beef short rib in particular encapsulates the essence of what Ad Hoc represents; simple, yet delicious food, family-size portions and no skimping on quality regardless of the informal setting. That’s a pretty good combination in my book. The cheese course is a nice intermezzo for the pièce de résistance, Ad Hoc’s ice cream sundaes. Served in thick, 1950’s retro glasses, the sundaes are a good dose of pure Americana at its best. Accompaniments include chocolate, butterscotch and strawberry sauces. Here, too, it is the small details that stand out. Roasted pecans are perfectly done, while the whipped cream is absolutely delicious even on its own. The ladies sitting next to us brag about having seconds. I thought they were joking, but locals tell me one of Ad Hoc’s unspoken secrets is that more food is always available, although it is hard to imagine being hungry after this meal. Coffee is served alongside dessert, which is not my own personal choice. I would think servers could easily ask guests if they would prefer coffee with dessert or after. I rarely drink in the evening when I am on a tasting trip, but if I do, it’s going to be bubbles; either beer or Champagne. 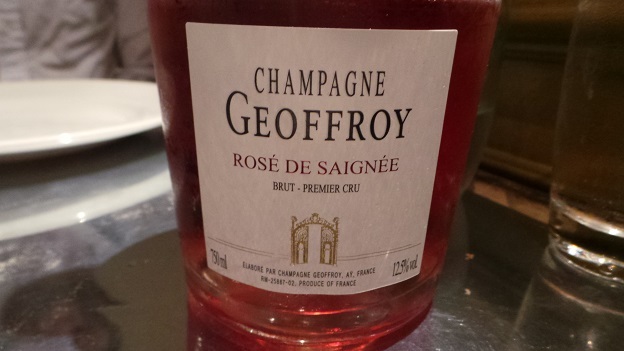 Rene Geoffroy’s NV Rosé de Saignée is light enough to pair with the first courses yet has more than enough volume and texture to stand up to the beef. Personally, I am a big fan of 100% Pinot saignée Champagnes. Geoffroy’s is one of the best. Readers visiting Napa Valley should make a point of having at least one dinner at Ad Hoc. The food, ambience and service are all pretty hard to beat. It is also great to see how successful Thomas Keller has been at translating his trademark attention to detail and focus on ingredients to his lower and mid-tier restaurants. One of Keller’s key beliefs is that good food does not have to be expensive. Of course, in a world where so much of the population struggles just to get by, a meal at Ad Hoc is a luxury and by no means inexpensive, but relative to the standards of Napa Valley’s top spots Ad Hoc delivers the goods, and then some.